Visit OaklandCountyHistory.org to access our full-text, searchable digital collection composed of a variety of original documents, death notices, maps, and photos in various formats. The focus is on pre 1930's copyright free materials. Note: Avon Township became the City of Rochester Hills in 1984. See below. Note: Avon Township became the City of Rochester Hills in 1984. Oakland County was named for its oak trees. The first settlement began where Saginaw Trail crossed the Clinton River. The county was not heavily wooded and was mainly agricultural. Oakland County Historical Resources, a 501(c)3 consortium of libraries, genealogical and historical societies, seeks historical materials pertaining to the Oakland County, Michigan area to make them searchable and accessible to the public. We digitize local history materials and make them available to the world through our website: www.oaklandcountyhistory.org/. All institutions and individuals interested in preserving Oakland County Michigan history will be able to contribute items of historical value to the OCHR database making them accessible to researchers through one convenient online location. 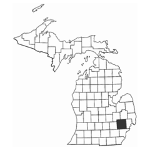 Oakland County Historical Resources, a consortium of libraries, genealogical and historical societies, seeks historical materials pertaining to the Oakland County, Michigan area to make them searchable and accessible to the public. For information regarding OCHR membership, see our OCHR Member Agreement / Membership Application. If you would like to contribute to the database, please contact us at ochr@orionlibrary.org or (248) 287-8027. Copyright free (or with rights obtained) digitized materials relating to Oakland County will be accepted. The contents must be documented with citations and / or sources. The majority of the consortium's financing comes through member dues paid by libraries and genealogical and historical societies but cash contributions are greatly appreciated. Gift funds will be used to update and maintain digitizing equipment, purchase software or to underwrite website enhancements. Oakland County Historical Resources (OCHR) is providing these links to you only as a convenience and the inclusion of any link does not imply endorsement of the site by OCHR. © 2003 - 2019 Oakland County Historical Resources. All Rights Reserved.